A freestanding kitchen is a characterful addition to any home, especially one with a traditional style. Pieces of furniture can be collected, mixed and matched, to create the perfect kitchen scheme to suit your family’s needs. Use these freestanding kitchen design ideas to inspire your project. Find out more about designing a freestanding kitchen: cabinets, islands and larders. And when you've figured out all the elements you need, we've got any more questions you might covered in our ultimate guide to planning and designing a kitchen. Why choose a freestanding kitchen? Fitted kitchens might seem like a better use of the space, but once you have one, you’re committed to it. With a freestanding kitchen, furniture can be moved around or even replaced if you find something that better suits the space. Old homes with their wonky walls can make fitting cabinets more difficult, whereas freestanding furniture works well. Lending themselves to vintage furniture and flea market finds, freestanding kitchens can be a cost effective way of redesigning a kitchen and creating the perfect space. If you’re a fan of DIY or craft, you could really make the project your own by upcycling furniture that you already own and repurposing it for your lifestyle. If all your vintage finds need are a lick of paint, have a read through our step-by-step guide to painting furniture but if it's a matter of restoring old wooden furniture, we've got a guide for that too. With their awkward angles and uneven walls, country cottages can benefit from freestanding furniture which can be easily positioned to make the most of the space. Antique wooden pieces with their time-worn patina are a great complement to rustic timber beams and stone walls. Love this kitchen? You are going to love more of our traditional country kitchen ideas. If you prefer fitted cabinetry, but like the relaxed look of an unfitted kitchen, a great compromise is to have fitted base cabinets, but to replace fitted wall cabinets with open shelving. Not only will shelves help enhance the feeling of space, they are a great place to display kitchenalia and pretty ceramics such as the Valleys to Headlands kitchenware from The National Trust. If you are after more kitchen storage ideas, go and have a read through our feature. For versatility over a kitchen layout, opt for freestanding units. Whether you need to create extra space for entertaining or simply fancy a new look every now and again, this unfitted Milton Oak kitchen island, £1,700, and Milton Oak drinks cabinet, £1,400, both from Laura Ashley, have a chunky real wood design perfect for an old farmhouse. Thought to date back to the 17th century, the classic Welsh dresser has become a mainstay of the traditional farmhouse kitchen. A timeless piece, it's worth investing in either a good quality antique version or new handmade version which will stand the test of time and can be passed down the generations. While the base cabinets and drawers offer ample kitchen storage for crockery and cutlery, the open shelves are ideal for displaying treasured pieces. If it's farmhouse kitchens you love, check out our dedicate feature of swoon worthy ideas. A mixture of stand-alone appliances and just two freestanding units helps create an open-plan kitchen that feels spacious; the homeowners cleverly created extra storage by converting a cupboard into a larder and choosing multi-functional bench box. Whether your kitchen is fitted or composed of freestanding units a moveable kitchen island is a really handy addition. A brilliant way to zone social and cooking spaces, they can be repositioned when extra space is needed, plus create extra workspace. Get more inspiration with our kitchen island design ideas. Whether it be cherished heirlooms or time-worn flea market finds, opting for a mix of antique and vintage wooden furniture will help create a warm, homely feel reminiscent of a traditional farmhouse kitchen. For best effect, pick pieces that don't match exactly. Your room will work best if they are of a similar style or period, and of complementary proportions, but choosing non-matched furniture will give your kitchen a more relaxed appeal. If you live in a old cottage, your home is likely to be filled with nooks and crannies that run the risk of becoming dusty, dead space. Instead, use these spaces to slot in a small cupboard or place a tall dresser behind a door. If part of your kitchen is fitted, you can even paint your freestanding furniture to match, or leave it bare to create a rustic contrast. Have a snoop around these charming cottages for more ideas. Kitchen storage doesn’t have to mean cupboards. You spend money on pots and pans, so why not have them on display,? Create a rustic-style farmhouse kitchen by storing them on wooden tables with extra shelving underneath, or hang them in attractive displays on wall hooks. This will save on space, and your pots and pans will be closer to hand when you’re cooking. An old butcher’s block is the ideal item of furniture for a freestanding kitchen with a rustic or industrial feel. 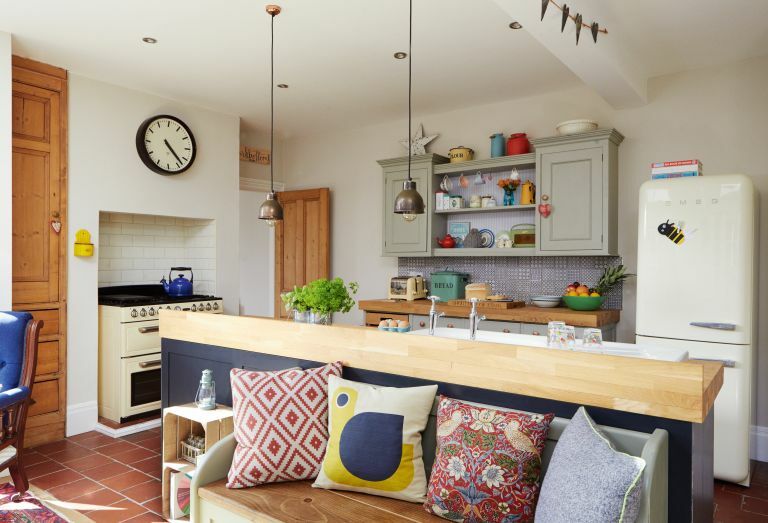 Butchers’ blocks can stand as an island in the middle of the room, or create another worktop or preparation area when pushed up against the wall. Paired with a couple of tall bar stools, they can even be used as a smart little breakfast table. If you are lucky enough to have a period home with lofty high ceilings then wall mounted plate wracks, individual cabinets and sheila maids mixed in with fixed cabinetry is a great way to make the most of your space. For a similar ceiling dryer try Garden Trading. Whether you’re looking for a traditional decorating scheme, or trying to add a modern touch to your period home, reclaimed industrial furniture is the perfect way to add character to any space. With a freestanding kitchen like this you can mix antiques and modern additions seamlessly. If it doesn’t work, you can simply move the units around until it does. For more industrial style kitchen ideas check out our gallery. Pairing fitted cabinetry with a few upcycled freestanding units is a great way to add a touch of unique style. Try refreshing ornate old dressers with chalky furniture paint in a contrasting colour as done here. If you need any tips on how to paint kitchen cabinets, we've got a easy to follow step-by-step guide. If you’ve only got a small kitchen, the obvious choice would be to maximise on space with fitted units, but this doesn’t allow for flexibility. Instead, a few well chosen, expertly placed freestanding units can be a really clever use of the space. Make sure you’ve got room for everything you need, and if you find that there isn’t enough, just swap out a unit for something more useful. For more tips of on designing a small kitchen have a read through our dedicated feature. A good, well-stocked larder is a sure sign of a prosperous home; bespoke is best, as always, to fit in seamlessly with the rest of your cabinets. This painted-inside larder has been created by Guild Anderson. We've got lots of pratical pantry storage ideas too, to make sure you make the most of that covetable larder.